Towards the end of the eighteenth century (c.1789), the Middleton Hall estate in the parish of Llanarthney, Carmarthenshire, south-west Wales was purchased by a former East India Company man, William Paxton (c.1744-1824). Over the following thirty-five years or so, Paxton went about transforming what was a relatively modest estate, erecting a new country house, developing the surrounding parkland and introducing innovative garden features. 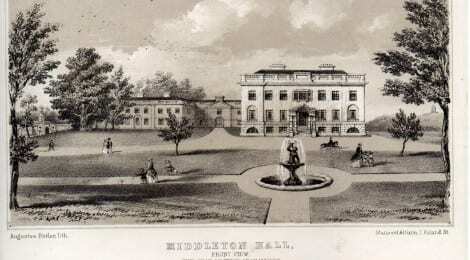 ‘Middleton Hall, Carmarthenshire’ highlights not only that Indian fortunes found their way to Wales, but also that men from outside Wales chose to purchase estates in Wales in an attempt to establish themselves in elite society following their return from India. To read Dr Lowri Ann Rees’s case study in full, click here.